BANGI, 10 July 2012 – There is still apathy among some staff and students of The National University of Malaysia (UKM) towards occupational safety especially with regards to fire alarms and emergency exits. 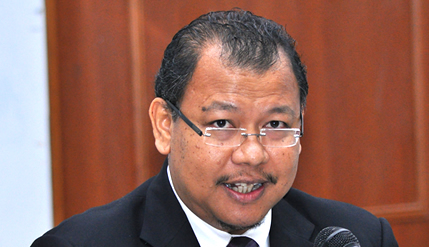 Deputy Vice-Chancellor (Academic and International Affairs), Prof Datuk Dr Noor Azlan Ghazali urged that safety regulations already in place be complied with before anything untoward happens. He expressed concern that facilities for emergencies have either been abused, not maintained properly or fallen into disrepair. He said this when opening UKM’s Occupational Safety and Health Week (MKKP) at the Faculty of Social Sciences and Humanities (FSSK) here today. Prof Noor Azlan said complacency should not be allowed to set in because risks always exist and no place can be fully safe. He cited the general reaction towards fire alarms as an example of such apathy saying that he had received reports of indifference towards fire alarms. He had even experienced one such incident at his office when he saw that almost everybody just ignored the ringing of the very loud alarm with some even complaining that it was an inconvenience. The Fire Services Department requires everyone to be evacuated, usually leaving the building or facility and congregate at an open area in an emergency situation even if no fire is seen. He lamented that the same reaction occurs during a fire drill. Despite repeated warnings and information given to all staff and students, few actually comply with the procedures. Even more worrying was the findings of a survey by the JKKP which shows that some fire exits had been locked with no one knowing who holds the key, in direct violation of the Fire Ordinances. Supposedly the move was to prevent theft or unauthorised entry into premises. There had even been passages leading to fire exits blocked by crates and furniture because the space have been turned into stores. He warned that if such attitude persists, tragedy might befall the campus one day. Campus-wide inspections also revealed fire extinguishers that were either not working properly or unserviceable due to years of neglect. He wants the JKKP to take stern action to deal with such shortcomings because of the potential tragedy should anything untoward happen. Everybody needed to cooperate to make UKM a safe place to work, study and enjoy, Prof Noor Azlan said.